Fluto Shinzawa might be a fine hockey writer. I can’t judge the entirety of his work because he reports on the Bruins, and I try to avoid writers who work the Human Waste Beat. But he’s on the HockeyFrinkiac follow list, and that’s as good a sign as any that Shinzawa isn’t adding much overall value to NHL hockey coverage. 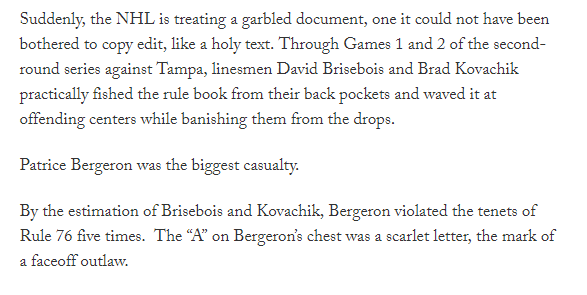 Which brings us to today’s lesson in How to Be a Terrible, Lazy, Hockey Reporter: Shinwawa’s article about Poor Patrice Bergeron, and the Big Bad Hockey Linesmen. Since it’s behind The Athletic’s paywall (act TODAY for time-sensitive savings! ), I will only highlight some of the most enjoyable excerpts. Step 1. Lay Out a Legitimate Question. 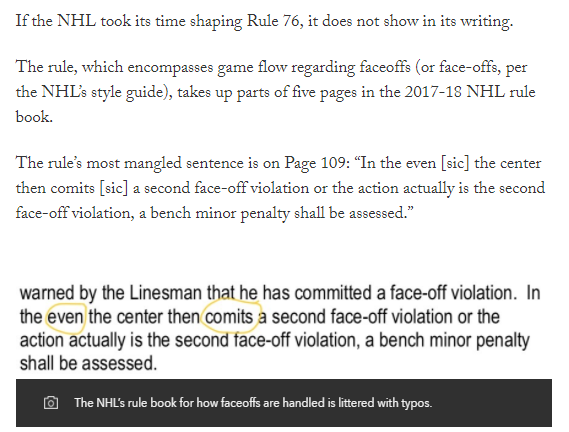 Shinzawa actually starts off promising: The NHL Rule Book can be a mess, and it is really embarrassing that it includes basic typos. 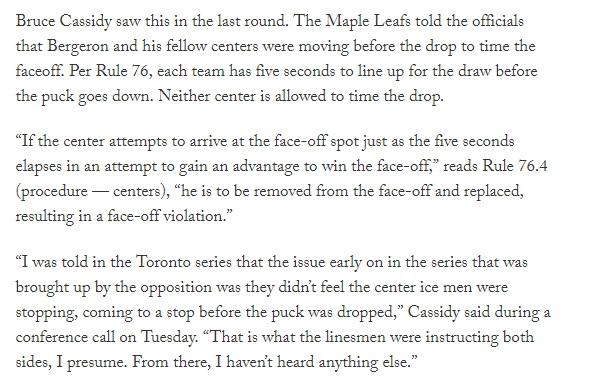 Maybe it is true that NHL Linesmen are applying the rule differently in the playoffs, and it’s affecting the Bruins more negatively in specific. A writer for The Athletic should have the resources to examine this question in fine detail! I can't wait to see what he found out! Step 2. Evidence, Schmevidence! The Player *You* Like Is the One Being Screwed! Bergeron was the “biggest casualty.” Shinzawa totally went back and looked at all the playoff games to examine each faceoff winner and loser right? He surely has facts to back this up, and not just hyperbole to make his readers feel ANGRY dat da NHL is SCREWIN’ ova da BROOOONS. The Scarlet Letter reference is a nice touch, though even that operates under the risky assumption that Bruins fans read anything more than complex than Sunday cartoons. Step 3. Miss The Point, Wildly. So the one time the Bruins won the faceoff, they still lost out? Oh, Fluto, you are *this close* to making a realization about faceoffs that will blow your mind. Bergeron says he doesn’t know. Fair enough, if you are willing to believe that a guy who has been thrown out of 23 faceoffs over 8 games has *never* been told a single reason why. Bergeron has no idea – but some guy named Bruce Cassidy apparently does? I can’t imagine why that would matter though…why would we care about the thoughts of...*checks notes*…Bergeron’s head coach? Ok ok I kid. Shinzawa never even asked the NHL for clarification. Solid investigative technique right there. Step 5. Answer Your Own Question Which I Guess Isn’t a Mystery At All? Step 6. Wait This Happened Before, THIS SEASON? Haha that’s a funny inside joke, which will really resonate with the drunken teens puking and spewing racist bile all over Boston. Step 7. Point Out the Absurdity[?] of the Consistent Application of Rules. "For whatever reason"? Can't imagine why the League would decide that enforcement of the rules is important in the playoffs. It's not like it warned the teams about this exact issue at the start of the season or anything. What nerve!! I give up. In less than 1000 words, Shinzawa asked a question that had been likely answered months ago, was probably re-answered last week, that didn’t apparently matter to the outcome, and he didn’t take the time to go to any relevant source for specific facts, confirmation, or clarification. Another solid hire by The Athletic. I’d suggest that Bruins’ fans deserve better, but, really, do they? ...Again I’m right in my analysis.